If you are like most women who have already planned out their entire wedding since you were a youngster, you would be in for a surprise once you plan an actual wedding. You will come to realize that everything will not be all roses when it comes to wedding planning. This is why some couples opt to hire wedding planners or at least delegate most of the tasks that need to be done to professionals. This article is all about making the wedding planning process a more manageable affair by using printable wedding templates. We have included different types of wedding stationery designs that may be used for weddings and receptions. Feel free to browse through them to feel inspired when choosing your own wedding stationery. There are different routes to take when it comes to creating your own wedding papers. The first one is by creating handmade card designs for your wedding while the other is the use of printable wedding templates. 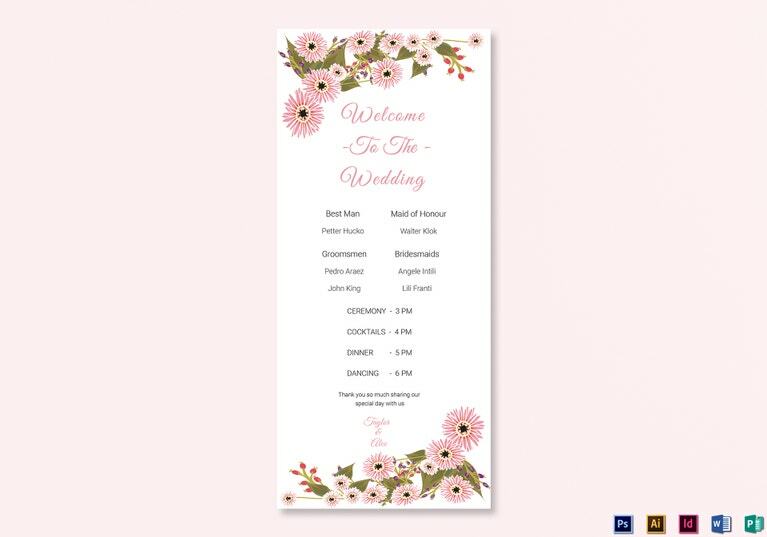 This article focuses on the use of wedding printables and that is why we are providing a list of practical reasons why going the printable template route for your wedding is the best step to take. They are cheaper. For those who have a limited wedding budget, finding different ways to cut down on the wedding expenses is a good idea. For instance, using wedding printables compared to having your wedding invitation cards personally handcrafted will cost less in the long run. Even if your wedding invitations are not customized, you may still need to pay for the designing, layouts, and rendering of the cards. All these things will add up. But you can surely get around it by using wedding printables instead. In fact, there even are free wedding printables that you can use to your heart’s content without forking a penny for it. They are easy to use. As its name suggests, printable wedding templates allow users to readily print out the wedding card that they desire. They do not need to learn how to use Adobe Photoshop, for example, and create their own card designs. These templates are pre-made by experienced graphic artists so that you do not have to think about this aspect of the wedding card creation process. Most of these printable templates are already formatted with print bleeds or margins and will be created using the CMYK color model to ensure that printing will go on smoothly. In addition, most printable templates are created and stored using industry standard software programs like Adobe Photoshop, In Design, PDF, or even Microsoft Word. This ensures that you will be able to open and/or edit the files at your convenience. They save you time. Another major advantage of using printable wedding card templates is the amount of time and effort it lets you save. Compared to personally creating or commissioning someone to create your wedding invitation card design, the amount of time you will spend on using pre-made wedding printables will be considerably lesser. You may then devote this free time to other tasks and easily tick off more items or tasks in your wedding checklist that you wouldn’t have been able to do if you were stuck designing invitations. They allow you to create a unified theme for your wedding. When creating or using a card template for your wedding, you will have all the control in terms of how the templates will look. This is very helpful for wedding planners who need to adhere to a wedding theme or motif. Most pre-made wedding invitation template packets are designed around a central theme so that end-users will not have a problem when using them. 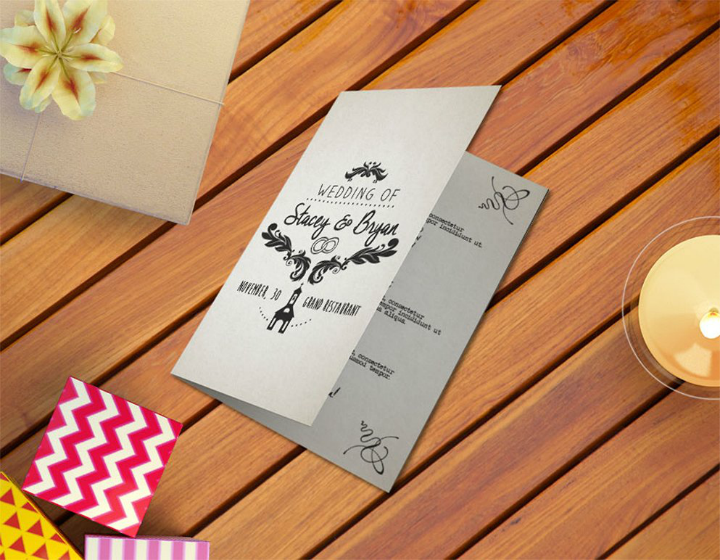 Wedding card templates may also be transferred to different online and offline mediums. For example, you may use the same graphic design elements in your wedding invitation and on your wedding website. You may reuse them for other design projects. Purchasing and using wedding stationery printables does not mean you are spending money on something that you will only use once. 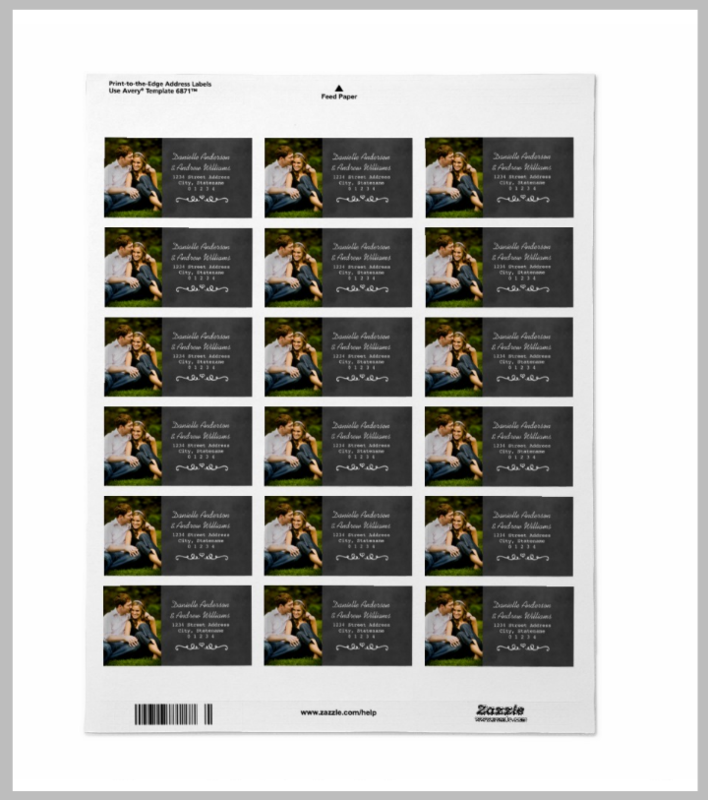 A great thing about printable wedding card templates is that these templates may still be used after the wedding. These templates are typically stored in PDF, PSD, EPS, or DOC formats so you will be able to customize them to match the next occasion. 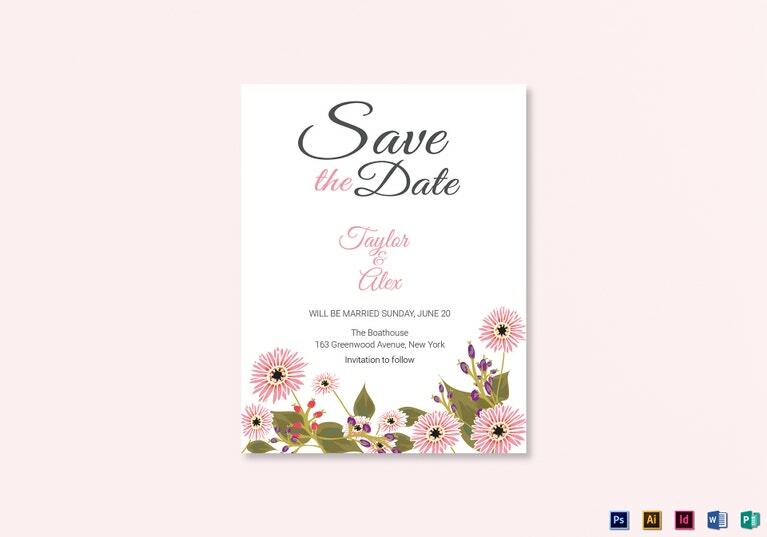 Listed below are different examples of printable wedding templates. They are subdivided into different categories of wedding cards typically used in most weddings. Save the date cards are sent ahead of the official wedding invitation. If the couple has not yet decided on an official wedding theme, they may use any card design for their save the date cards. And since these cards are sent ahead of time, they have the freedom to change their decisions regarding the card theme. Save the date card templates allow couples and wedding planners to easily choose a card design that will match their wedding theme. When designing a save the date card for your wedding, you need to remember that this card is the first official piece of information that your guests will receive about the wedding (unless you have announced it over Facebook or Instagram and all your friends and relatives saw it). Even if you do not have all the details of your forthcoming nuptials, you should at least write the date and the venue where the wedding will be held. This allows guests to plan ahead of time. After saving the date cards, the next wedding stationery that all weddings should have are wedding invitation cards. These cards are touted as the most important wedding card since they are the official piece of wedding communication for prospective guests. 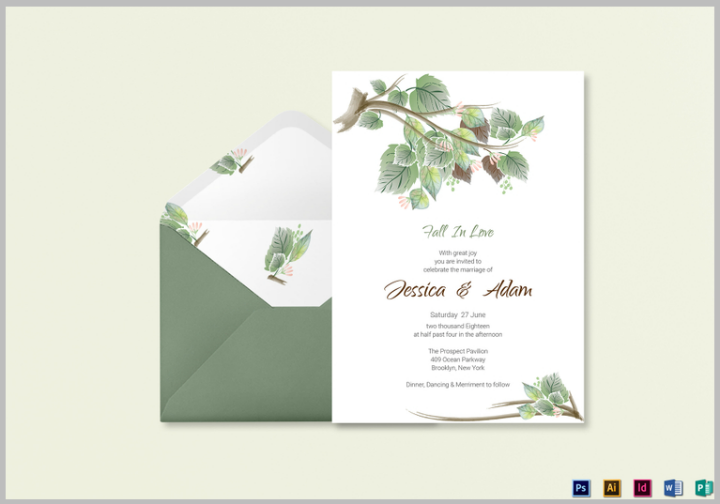 Wedding invitation templates will often follow the theme or motif that a couple has chosen for their wedding. For instance, a couple who chose a rustic wedding theme will most likely need to use rustic wedding invitation cards. 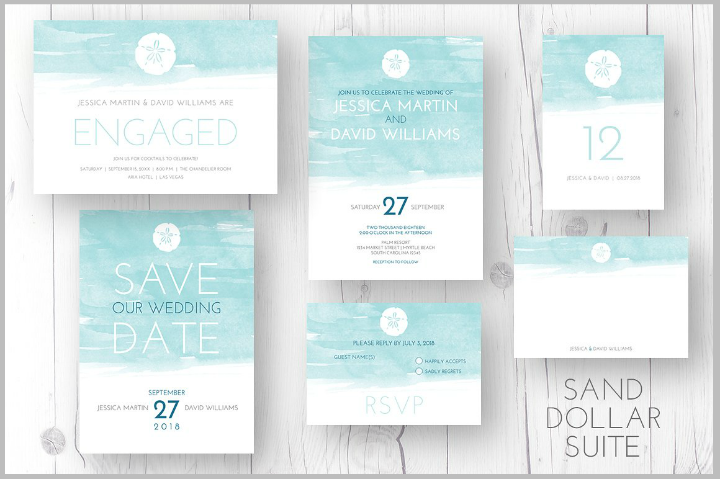 To ensure a smooth sailing wedding invitation creation process, you may use printable wedding invitation templates to hasten the process. 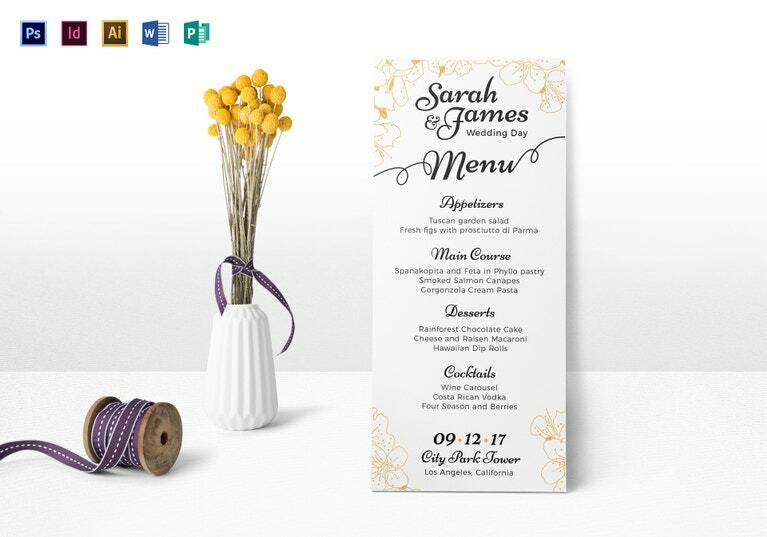 Pre-made templates will often already include all other wedding stationery templates like RSVP card templates, menu card templates, thank you card templates, and even wedding table card templates. 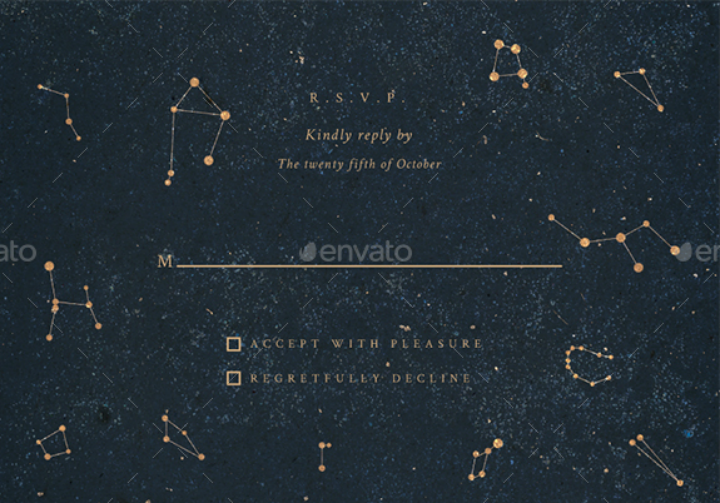 Embedded below are some examples of wedding invitation card templates. All of them are stored in ready to print file formats and are part of a wedding invitation suite package sporting the same design elements. They may be edited to reflect the correct details of your own wedding. Also, do not forget to check this link for more information on wedding invitation etiquette. Next up are printable wedding RSVP cards. For those who do not know, RSVP is the acronym for a French phrase that roughly translates to “Respond, Please.” This card is typically sent together with the wedding invitation card. It allows recipients of the invitation to confirm their attendance to the wedding. 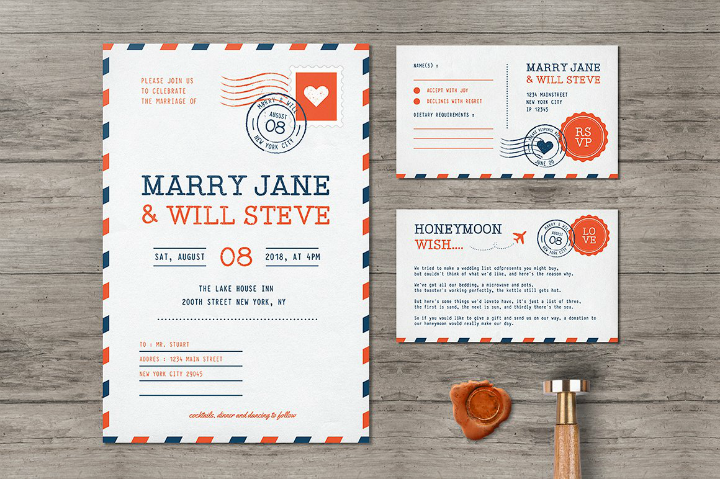 Some couples who follow a formal wedding motif may require the guests to send back RSVP cards at least three to four weeks before the wedding through snail mail. Others, meanwhile, may allow phone, text, or email confirmations. A tip: Avoid wedding invitation mistakes and review your invites before sending this out. Just like invitation cards, there also are printable wedding RSVP card templates. They can be used if you prefer to follow a specific card design for your wedding. With these pre-made templates, all you have to do is edit and add your own wedding details to the template. Then, you will be ready to print them out. Also, remember that if you wish for guests to mail back the RSVP cards, you may need to clearly indicate the address where they need to mail their responses. You may do this by using wedding address labels or by including self-addressed stamped envelopes with the invitation packet. 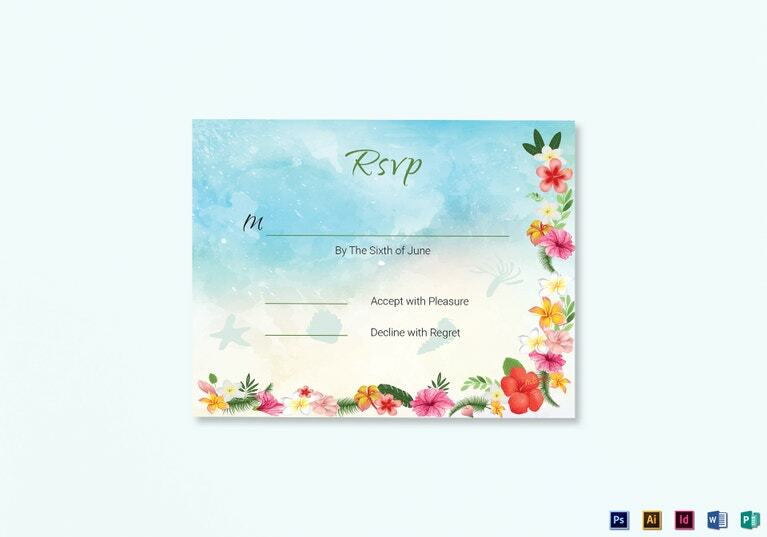 Depending on your wedding theme, you can go from formal floral RSVP card templates to uniquely customized RSVP cards, as you can see below. It is wholly up to you to decide what kind of design you want for your wedding. As mentioned earlier, wedding address label cards are used to indicate the address of the newlywed couple. Guests use this to send their wedding gifts and/or their RSVPs. These wedding cards are often printed on separate pieces of paper or card stock in the the size of a business card. When used in weddings, they will often be designed to match the design elements used in other wedding stationery. 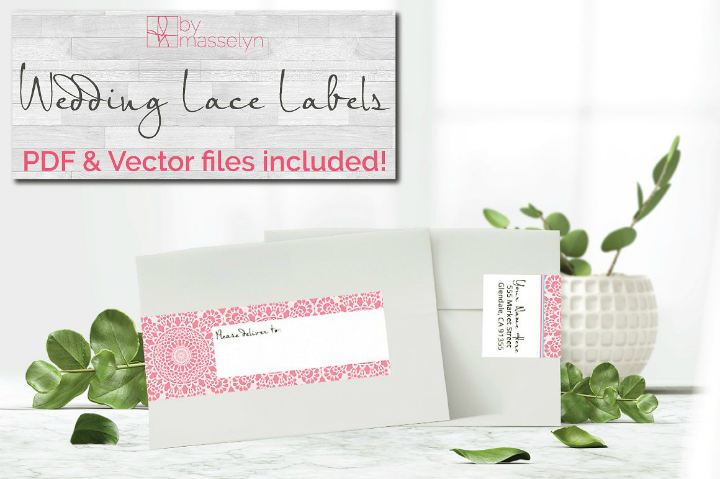 To personalize wedding address label designs, couples may add their wedding logos or engagement pictures to the label template’s layout design. 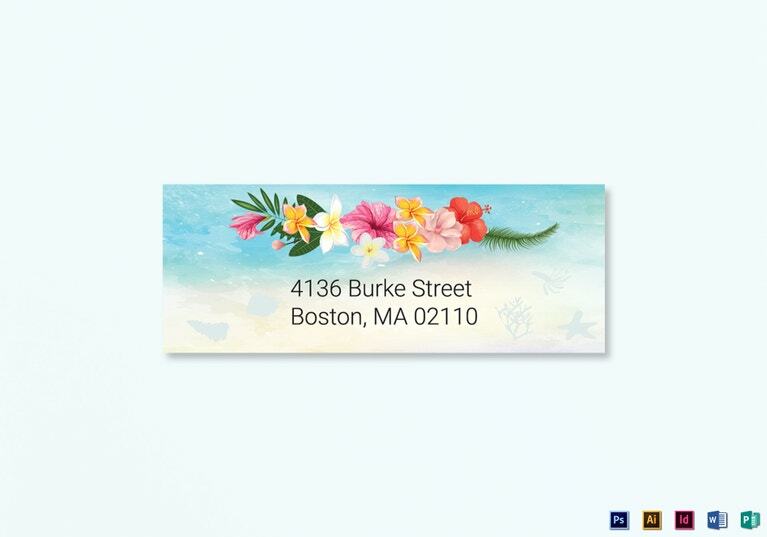 Listed below are different printable address label templates created just for weddings. 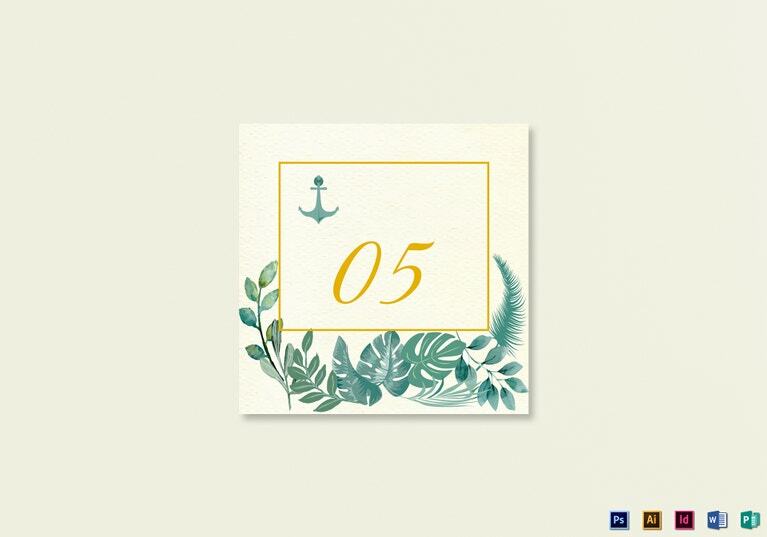 If the wedding invitation card, the RSVP card, and the printable address label cards are included in the invitation packet sent out to guests before the wedding, the wedding program cards are usually distributed on the day of the wedding or arranged with the table decorations on the reception venue. These wedding programs serve as a guide for your weddings guests during the wedding ceremony and reception. 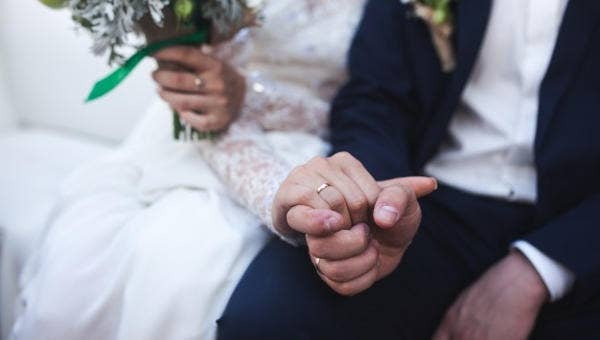 They typically also include information about the wedding entourage and may also include a mass guide (if the couple is getting married in a church). Printable wedding program templates are available online as well as templates for wedding invitations. We have embedded some examples below. 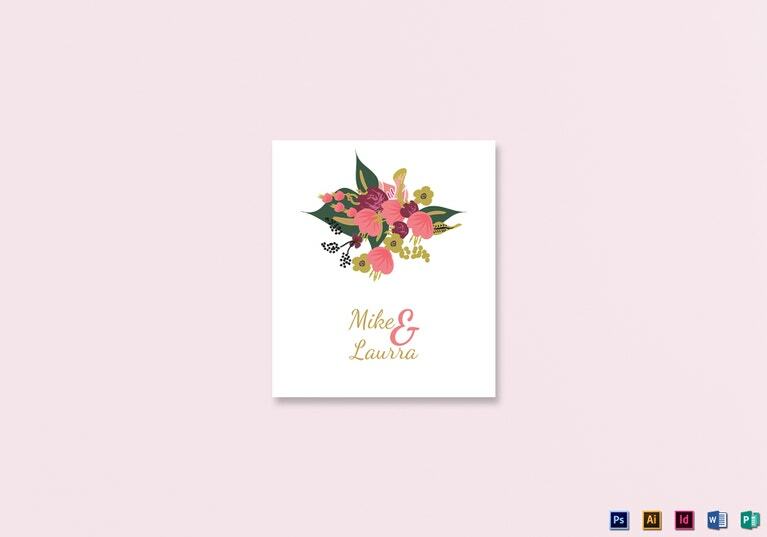 All of them are fully customizable, allowing couples and their wedding planners to add their unique touches to the card design. Traditional church weddings may have to use program templates in booklet mock-up designs while those following a more laid-back wedding ceremony may only use a double-sided layout. 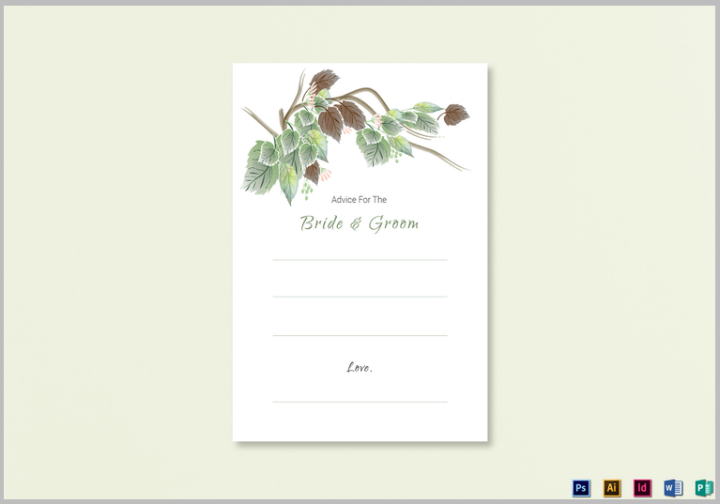 See below for examples of ready-to-print wedding program template cards. They range from the brochure type to single-page programs. Choose a program card layout that you think will match the kind of wedding ceremony you are having. Table cards are used to mark the name or number of a table. On weddings, they are used to help organize the seating positions of all guests. Therefore, wedding table cards typically function best when used alongside a master wedding seating chart. In order to pull off a well-organized seating arrangement for a wedding, it is very important to have an updated list of all guests. A tip: Always emphasize to your guests the need to send back their RSVPs. 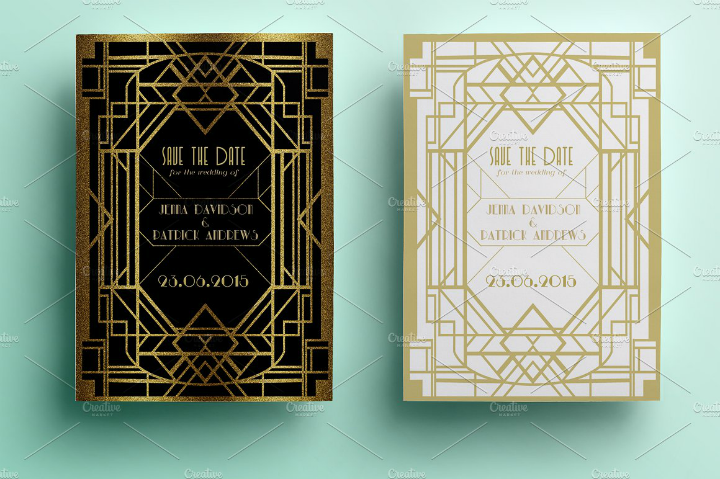 If you want your table cards to match the design theme in your other wedding stationery, it is best to use the wedding table card template included in most wedding invitation template sets. 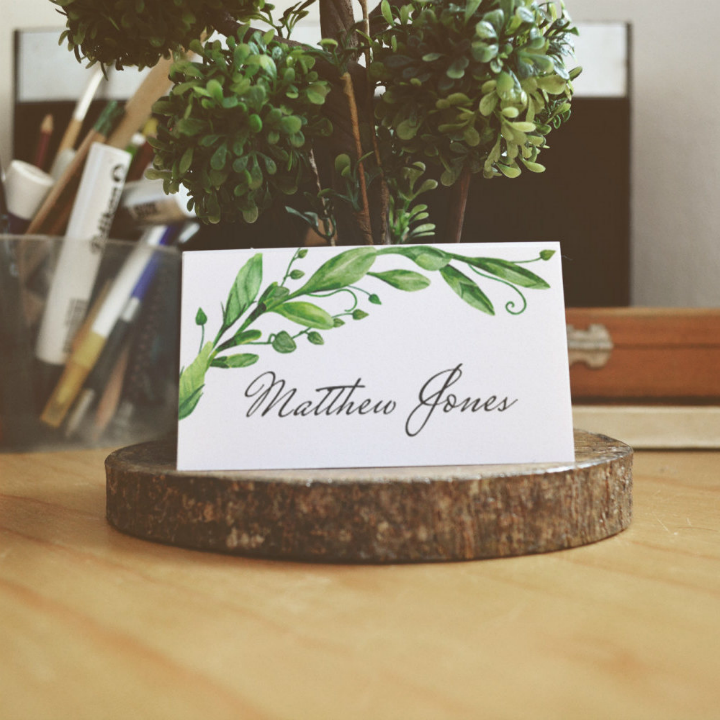 If that is not possible, you may still personalize your table cards by adding your wedding logo design to the template itself. Also, remember that wedding table cards need to be arranged in a noticeable way in the center of the table where guests can see them clearly. That is why it is best to print them out using heavy card stock and pin or attach them to a tall centerpiece. Aside from wedding table cards and program cards, wedding place cards are another type of wedding stationery that are featured at the different guest tables during a wedding reception. 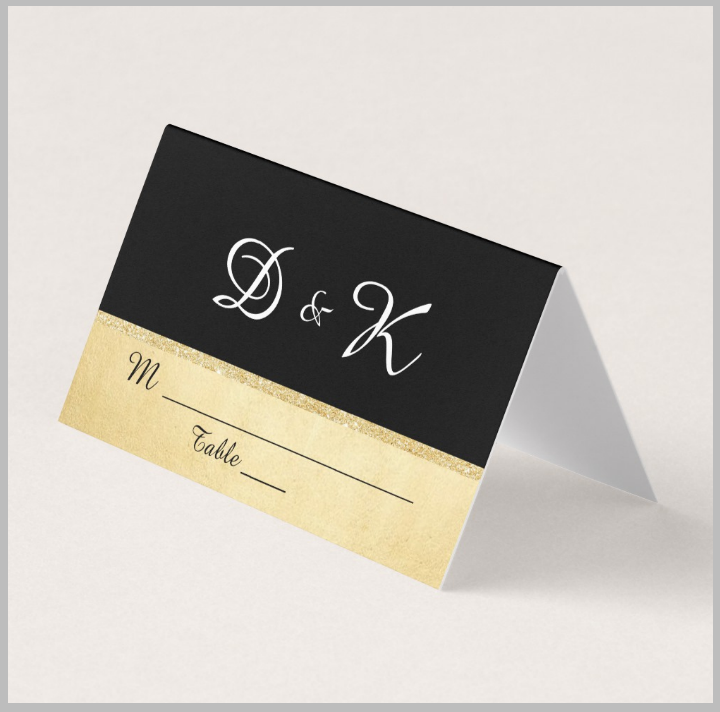 Wedding place cards are used to indicate a person’s specific seating arrangement in a table. This is an often-needed item if you do not want certain members of your guests to sit by each other or if you want to mix up the composition of guests at a table to include both friends and strangers. Pre-made place card templates for weddings are used if you want an easier approach to place card creation. Check out our list of example place cards that you can use for your own wedding. When choosing wedding place cards, simplicity is king. You may use simple logo designs superimposed on the couple names as a way to make the card your own. Aside from the ornate flower arrangements, luxurious decor, and stylish dresses, weddings are also known for the food served during the reception. And since most weddings are followed by a dining reception, it has become almost a custom to prepare an equally satisfying brunch, lunch, or dinner menu for the newlyweds and their guests. To let the guests know what type of food will be served, guest tables are often decorated with wedding menu cards. 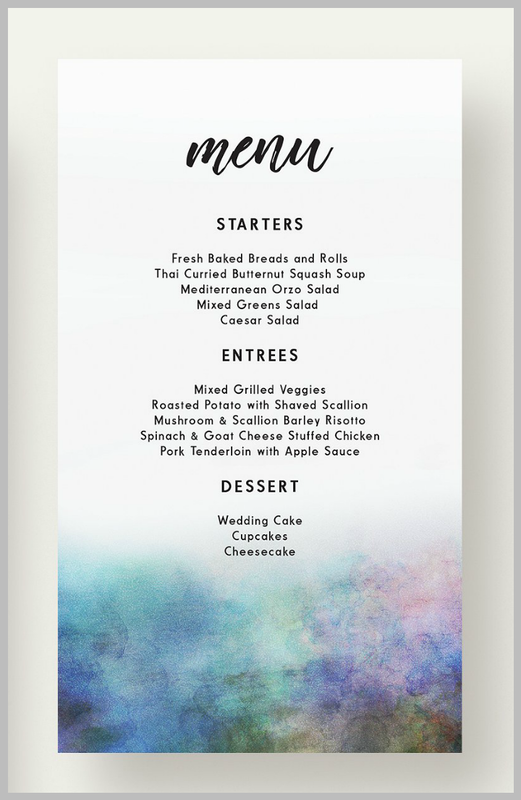 Couples and wedding planners may easily create these customized menus by using printable wedding menu card templates. This way, you do not have to worry about creating a layout and designing what the menu card will look like. A graphic designer has already done this part for you. All you have to do is type the entree courses you are serving for the wedding and voila! You may now begin printing out the menu card templates. When a guest sits down at his or her assigned table, the wedding menu card is often the first thing he or she sees. If you want to make an impression or sustain the impression you have created even before the wedding started, it is will be best to make sure that your menu card design matches the other wedding card designs that you have used. For more information regarding this, check out this link that talks about steps to create menu cards. Shown below are a few examples of menu cards used for weddings. Some of these are standalone menu templates while others are available as part of a wedding invitation template set. All these card templates have a printable format and follow the CMYK color model. This makes sure that the color you see on your computer screen will match the card’s color when it prints out. In addition, you may still edit the menu card’s color scheme by using your own preferred color palette. Another addition to this list of printable wedding templates are wedding thank you card design templates. As the name implies, thank you cards used in weddings are greeting cards expressing the newlywed’s gratitude to the people who attended their wedding ceremony and reception. In recent years, this practice is no longer common and busy couples seldom get around to sending them. But if you wish to stick with proper wedding etiquette, creating thank you cards by using printable thank you card templates is a welcome change to the current norm. This may also even lead to guests feeling pleasantly surprised by your way of saying thanks. Isn’t that just a nice way to start your married life? When creating a wedding thank you card, it is important to know that you do not have to follow the same graphic design elements used in your actual wedding invitations. Though using the same design scheme may help, you are not obliged to use them. Remember that the best weddings are those that have a genuine personal touch. See below for examples of pre-made printable thank you cards that you can purchase or recreate on your own that will match most wedding motifs or themes. 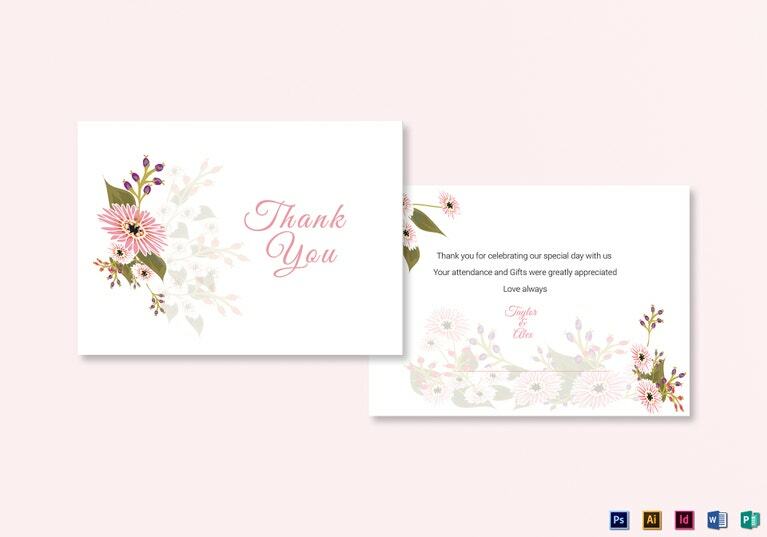 Take, for example, the Pink Floral Wedding Thank You Card Template shown below. 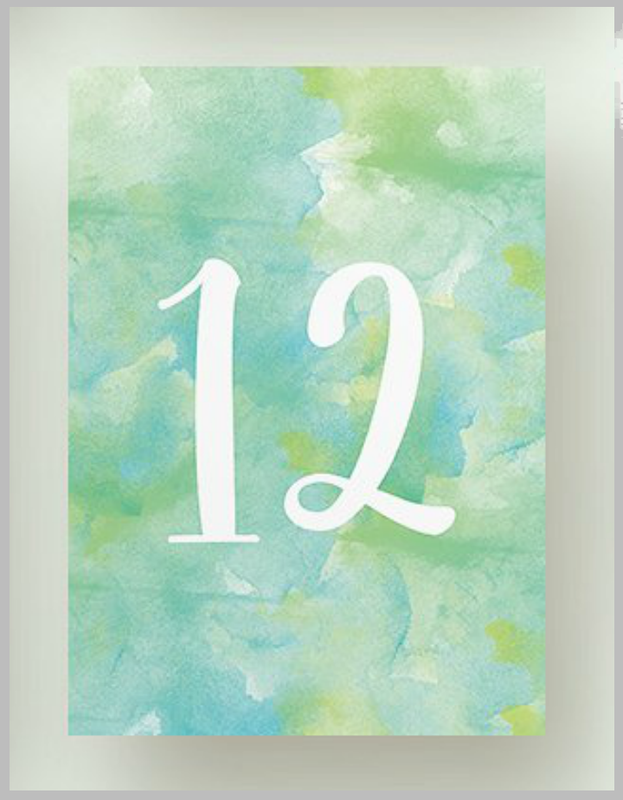 This thank you card template will match any wedding that is using floral wedding templates. 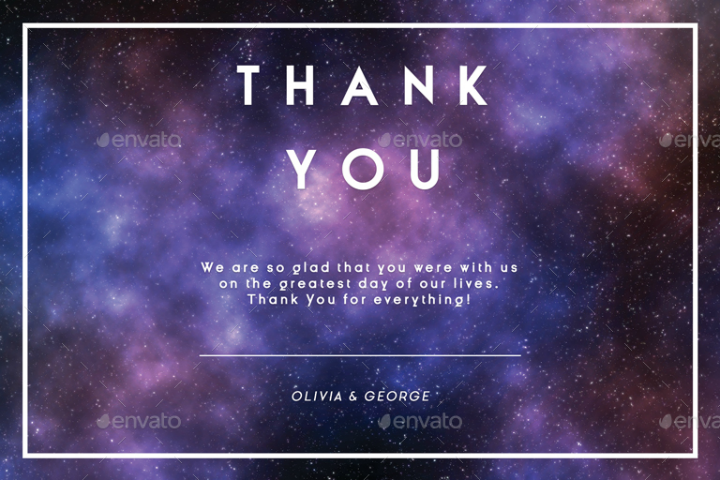 The Space Wedding Thank You Card (also shown below) will work best for couples who are planning to have a unique space-themed wedding. 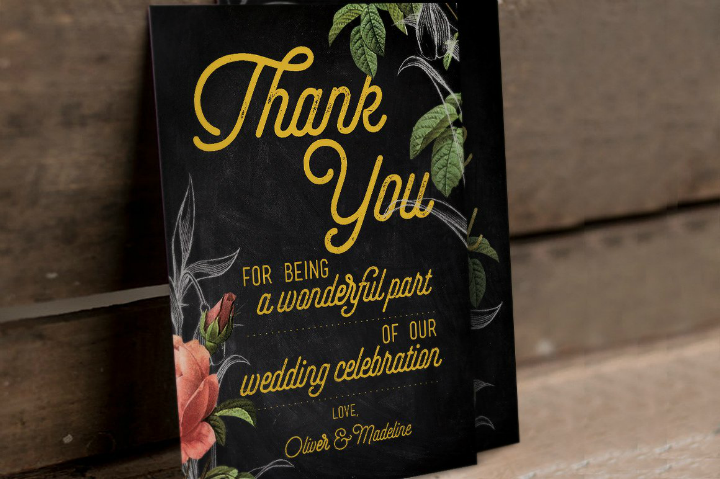 And those who have used chalkboard designs as the springboard for their wedding stationery designs can rely on the Hand-drawn Floral Wedding Thank You Card pictured below. The printable wedding templates listed above are the most common templates used for wedding ceremonies and receptions. However, if you want to go out of your way in planning for or creating different wedding stationery items for your wedding, you may want to take a look at the different miscellaneous printable wedding items described below. The first miscellaneous item is a wedding door hanger template. This is a thoughtful wedding accessory for destination weddings or for couples who have arranged for their guests’ hotel room accommodations. You may design a door hanger to match your own wedding motif and details. Guests will also appreciate this gesture especially if they had an awesome wedding party night. The next item is a wedding advice card. This printable card is best placed on the guest table at the reception party. Or it may also be distributed in the middle of the reception program. As its name implies, a wedding advice card allows guests to write down their pieces of advice for the newlyweds. This can be a source of helpful advice for the young couple, especially if they are compiled after the wedding. Lastly, another item that you can add to your list of wedding stationery must-haves is a bathroom sign template. You do not have to print out a lot of this particular template since you will only use a pair or three depending on the number of restrooms found in your reception venue. 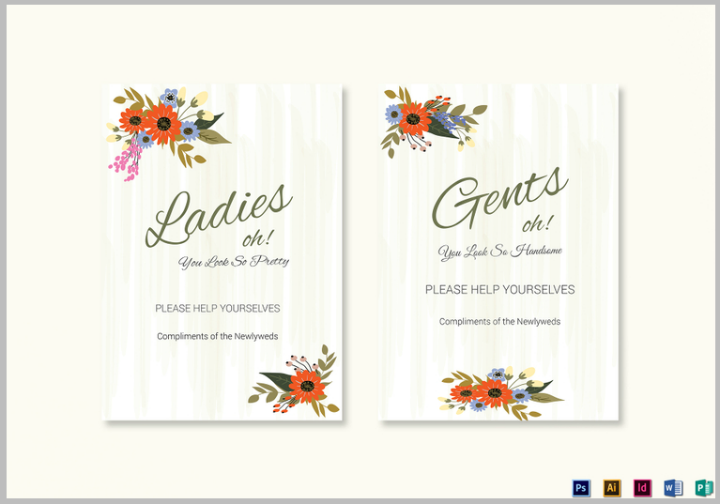 Printable wedding bathroom sign templates allow you to thank, compliment, or encourage your guests with a simple message while they are in the bathroom. Doing this has a sort of psychological effect on the guests, making them feel more welcome and taken care of during the party.